So Lets Fly to Every Airport in the State! 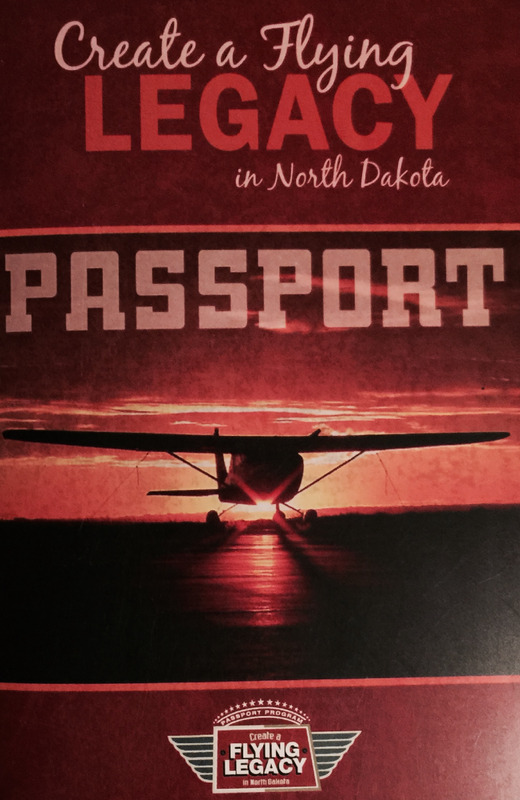 Last year I was having a conversation with my buddy Dennis Adams and we decided to start the Passport Program sponsored by the North Dakota Aeronautics Commission. 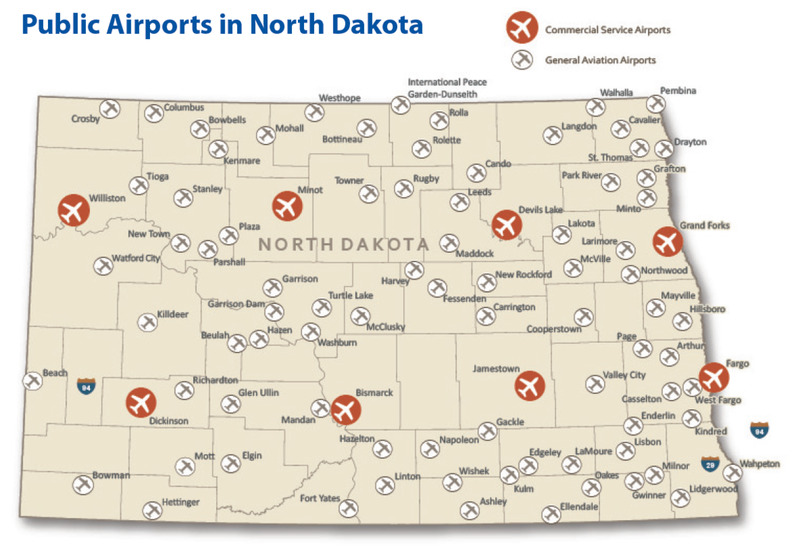 It is a program where you visit every airport in North Dakota—all 89 of them. We weren't sure when we would get started but we knew we would get it done. As fate would have it, cancer intervened with our plans as we lost Dennis earlier this year. Now it was a forgone conclusion, I am going to complete the passport program. After Dennis left us, his plane was sold to a friend of mine, John and he was very enthusiastic about doing the program. 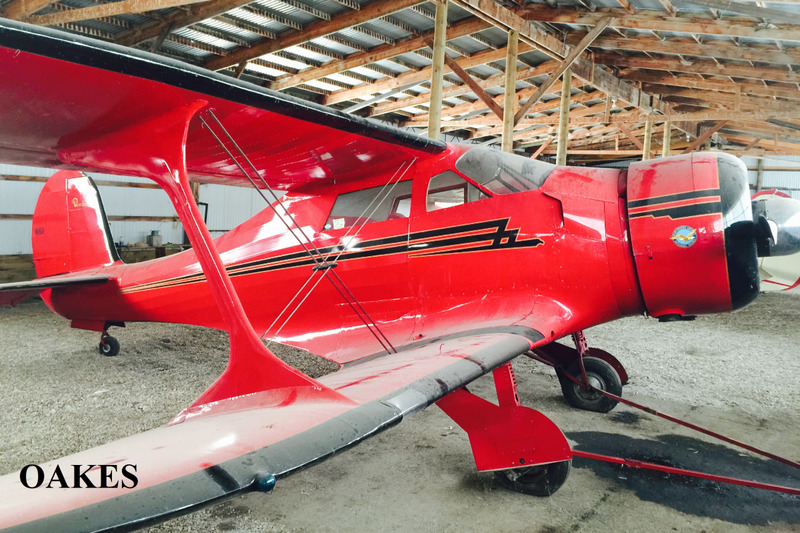 So much the better, we would be taking 171VA, Mr. Adams' Cessna 172 , on this quest. 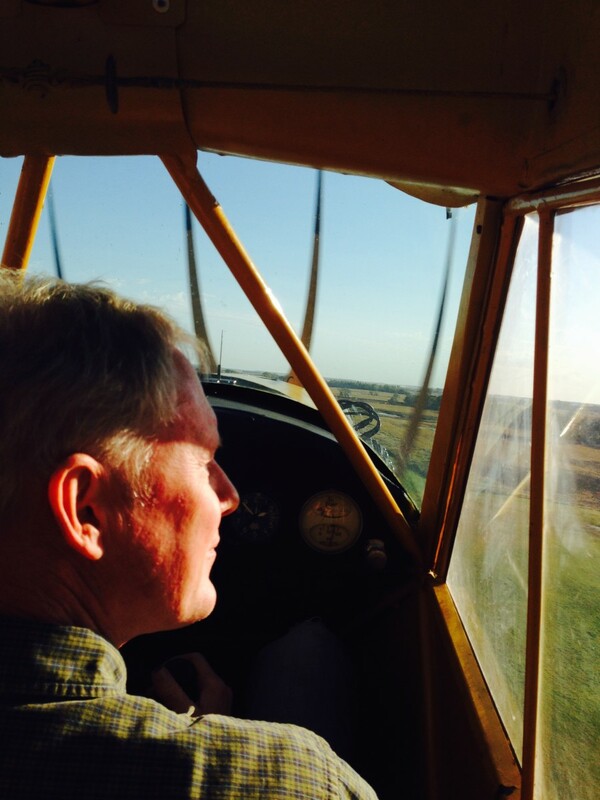 John was a student pilot so I said this will be an excellent learning tool. Living in Bismarck-Mandan we benefit from starting from the center of the state so we chopped the state into four quadrants. On a beautiful April morning Flight Service was advertising clear skies and no winds. We departed Y19 to knock off the northwest corner of the state. Lift off was at O-dark-thirty. Sounds good but this crew departed at O-light–thirty. We were on our way to Killdeer. The Killdeer mountains are beautiful in the morning sun. Some very nice ranches are nestled in the gullies and on the hillsides. We stopped to stamp our passport booklet and off to Watford city we went. On approach we announced we were 5 miles out only to hear a Cirrus was 10 miles out. He zipped on by us and was on the ramp when we arrived. 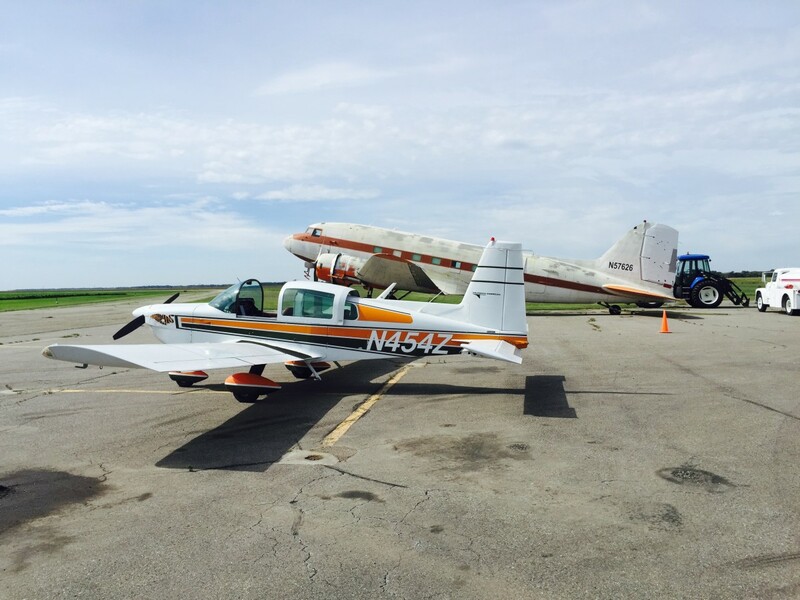 A quick chat with the other pilots and we were off to heart of the Bakken - Williston. We admired all the oil rigs as we went . Not unexpectedly our friend in the Cirrus zoomed by us again. Landing in Williston we visited all the FBO's and offices looking for a stamp. No joy. No one could help us so we left empty handed. Tioga, Stanley, Crosby and Columbus were next. Columbus was very dilapidated but the runway was superb, groomed like a golf course. The runway at Bowbells needed a shave but on and off we went. Then Kenmare and Mohall followed by Westhope and Bottineau, Then off to Minot. In Minot we got our stamp at the GA terminal. I saw Don Larson drive by on his way to Pietch's. After a brief visit with Don and a hello from Warren Pietsch we found out the Dakota Territory Air Museum was closed. We needed the two major aviation museums in the state to stamp our passports. It is only closed if you are not talking to Don Larson. We taxied over to the museum and the manager let us in to get our stamp. A brief tour and we were on our way to Plaza. Plaza did not need a shave, it had a full beard. At the end of the beard was the driveway for a new house. Yup we had a new house on the end of the runway with a few trikes, bikes and wagons in our way. Well a low flyby with some pictures and we were off to Parshall, New Town then Garrison for a late lunch. Garrison has always been more than accommodating to arriving pilots with an airport car and multiple choices for restaurants. It was a step down from the days Red Ewing would take us to town in his limousine. The joke about Red was what was his real first name? The answer: Red. With a full belly we were off to Riverdale, Washburn and home. Today it was 720 miles. A few weeks later on a beautiful day we lifted off Y19 to grab the southwest corner of the state. Today we departed after breakfast at the “Shiny Diner” also known as Kroll's Kitchen. First stop Glen Ulin, a very nice facility that we stop at often. Next stop Elgin. We are talking a grass strip that no one brags about. We over fly the "field" and note natures civil engineers (known as badgers) have been at work. We plan our serpentine landing that is well described in AIM-FAR and get-er-done. Off to Mott and then Hettinger and we still have all our wheels. At Hettinger I make the observation that towns have airports for several reasons: for civic pride, for utility and/or as the result of the actions of a single enthusiast. Here we have all of the above. 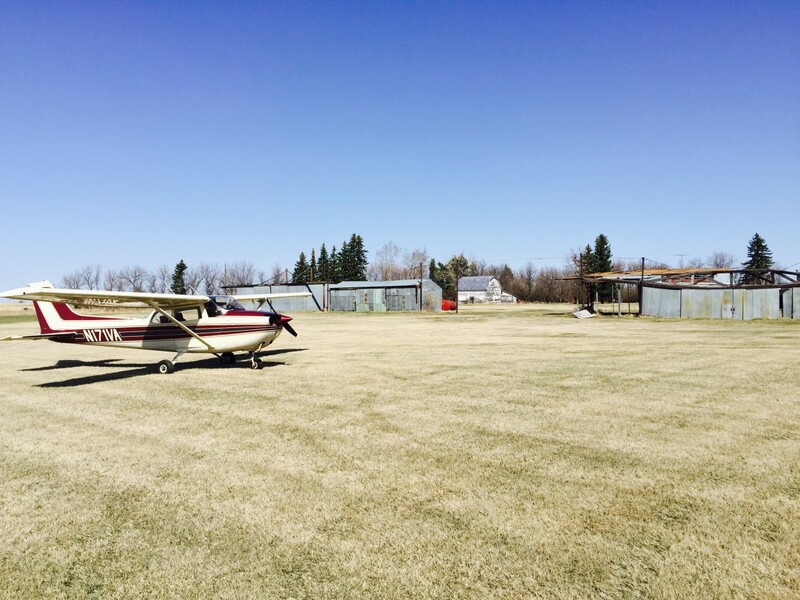 Hettinger has several choices of runways with taxiways. It was amazing. A tiny town that required a airport diagram. At the terminal we were greeted by Jay Lindquist and had a nice chat. Off to Bowman were we set up on an beautiful airport with some big X's on the runway. 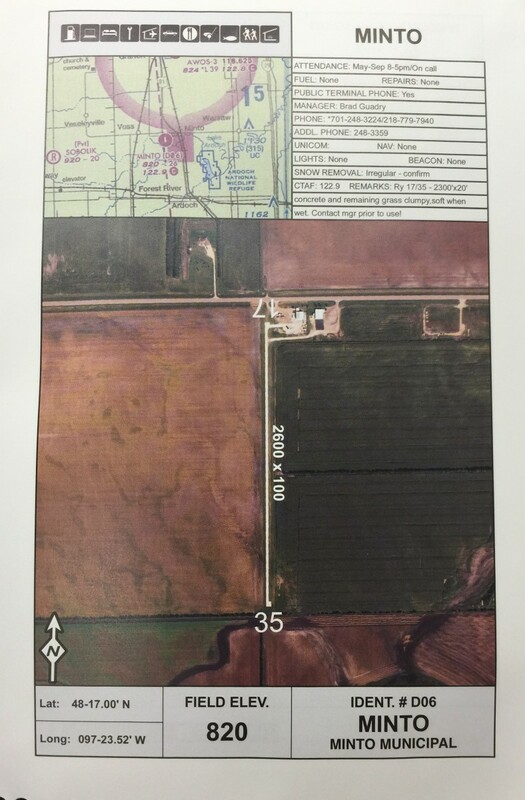 This is the new unopened field. Oopsie, we need the old one that is operational. The old strip looked like an aircraft carrier that ran into a trailer park. Water on all sides with a trailer park on one end. On the ground we were greeted by Brent Kline who fueled us up and told us of the new facility going in on the other side of town. Sounded great and most assuredly will be Airport of the Year once it’s done. With fuel, we were off to Beach then Dickinson. Both were pit stops leading up to Richardton. After making sure no cows were on the runway we landed among the cow paddies and rolled to a stop. Not to bad a strip. It was smooth. Under the wind sock we found an aluminum cylinder that had a screw top and an O-ring to boot. It was more akin to a time capsule than a container for a stamper. There is an Abby in Richardton and I think the monks had something to do with this container. 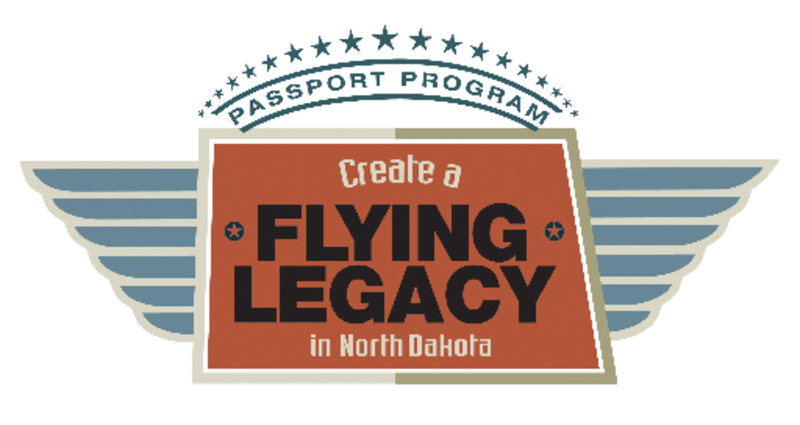 When the North Dakota Aeronautics Commission started this program they provided airports with mailboxes and stampers. I don't think everyone knows that mailboxes are a time proven design with billions of hours of proven reliability to keep paper dry in all conditions. Don’t tell the monks you can't improve on them. Unfortunately the cylinder was half full of black ink soup and a stamper. We drained the cylinder and took the stamper with us to deliver to the North Dakota Aeronautics Commission in Bismarck. A brief stop in Beulah and Hazen, both wonderful regular stops for us, and we were home. As summer creped up on us the incidence of thunderstorms increased. These round robin cruises became more difficult. 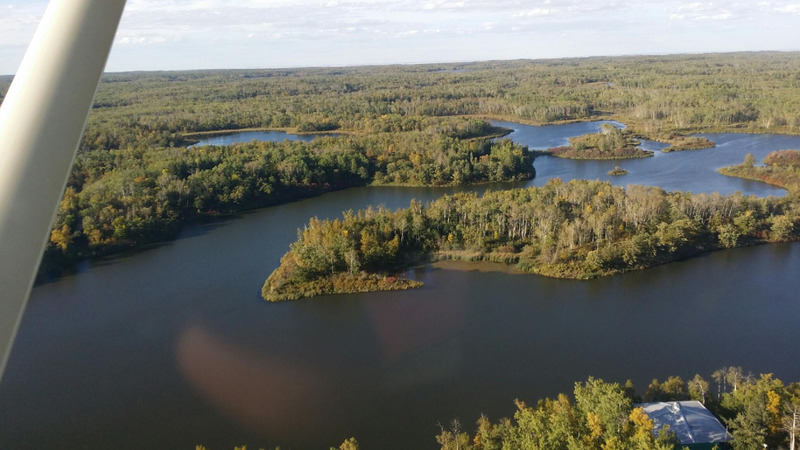 I made my usual stops to the surrounding airports to include Fort Yates, Hazelton, Linton, Turtle Lake and McClusky. McClusky had runway markers in the drink and Hazelton was wet all over. I enjoyed my visits with Mike Gunya in Linton so much that I forgot to get my passport stamped on the first two visits. Oh well. Every time we flew we were watching interesting echoes on radar. I suspended the systematic attempt to complete the program and resorted to my usual flying. My summer schedule involved multiple trips to Minot, Fargo and Minnesota. 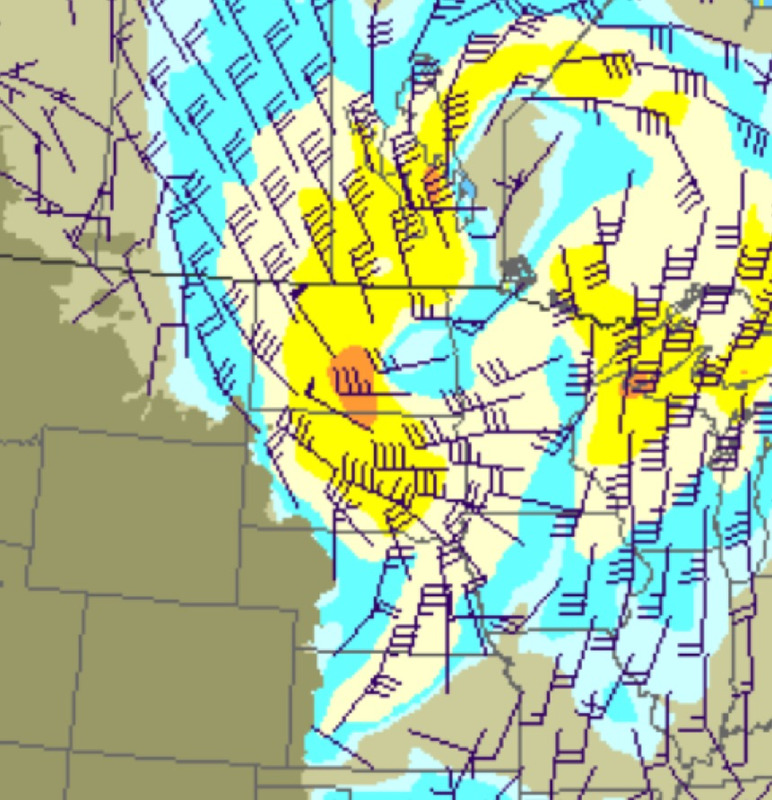 So now was the time to get the southeast corner of North Dakota taken care of. 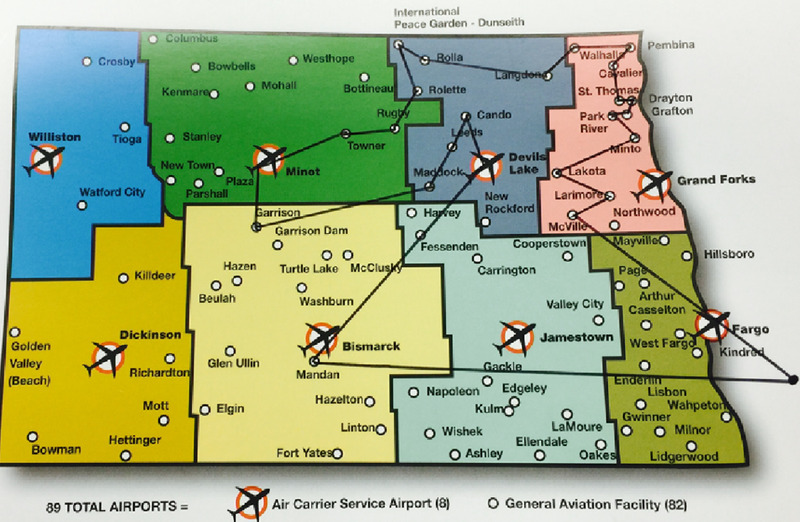 No shortage of airports in this quadrant. 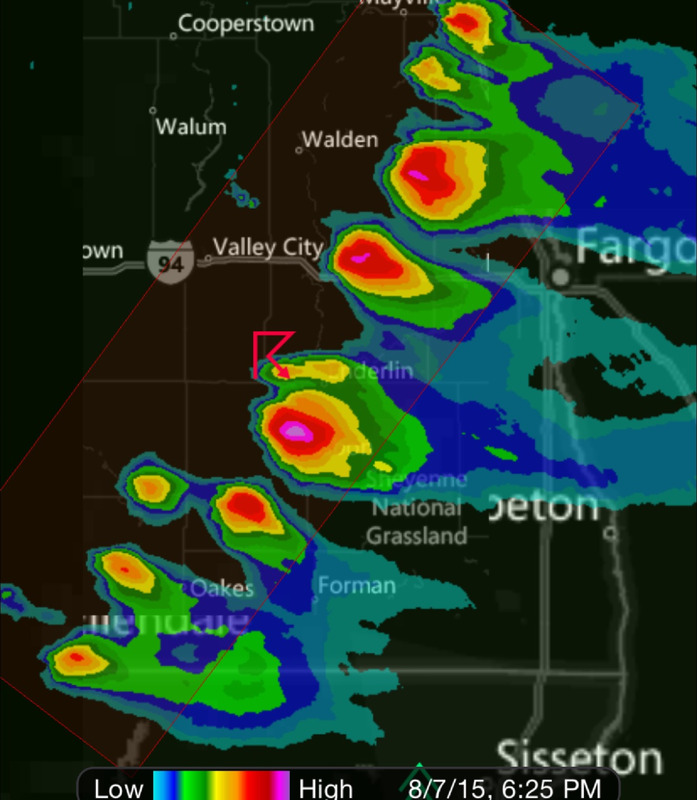 I split this up into the I-94 corridor, North of I-94, south of I-94 and the South Dakota line. In this way I could knock them off one at a time on my eastern travels. The first trip was a trip to MN where I had a full day to do north of I-94. I hit Harvey, Fesseden, Carrington, Cooperstown, Mayville, Hillsboro and Arthur. Okay now I’m sounding like that Johnny Cash song “I’ve Been Everywhere”. While in Mayville, they didn't recommend Arthur as the field was wet. In Hillsboro, they had been there earlier in the day and said it was dry. They were both right. 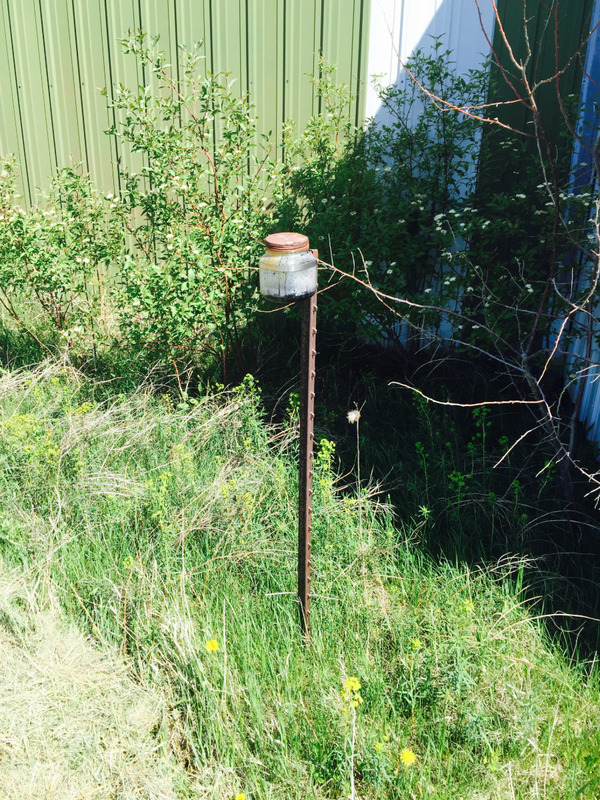 The runway was dry and the stamper was kept in a jar with a hose clamp on a fence post south of the hanger. Like Richardton they thought they could improve on time honored mailbox concept when they only provided black stamp soup. I guess the recipe is getting around. With that stop, it was off to Minnesota for the weekend. I woke up to a beautiful day on Saturday so I called a friend in Jamestown, Bob Wells, and offered him an airplane ride. He was game so off to Jamestown I went for a stamp and a ride. A pit stop in Page and West Fargo and then on to Jamestown. 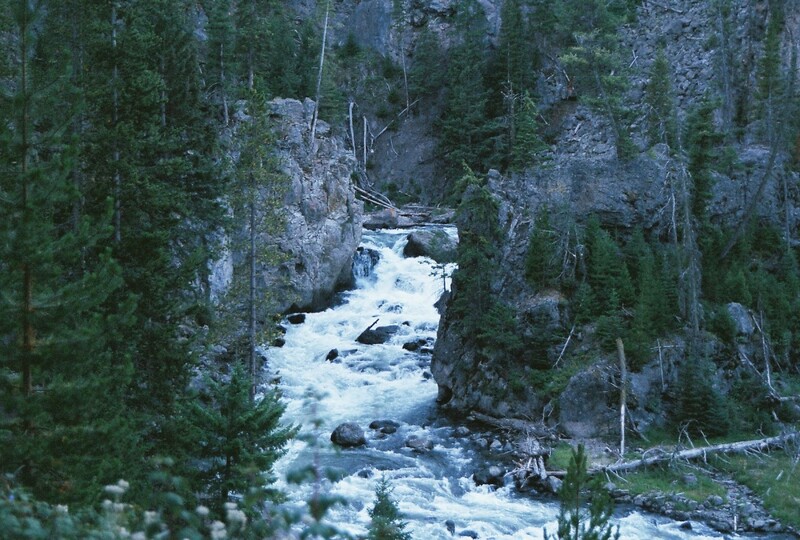 A pleasant ride up and down the James River was cut short by weather looming in the west. I left Jamestown and planned to wait it out in Castleton. 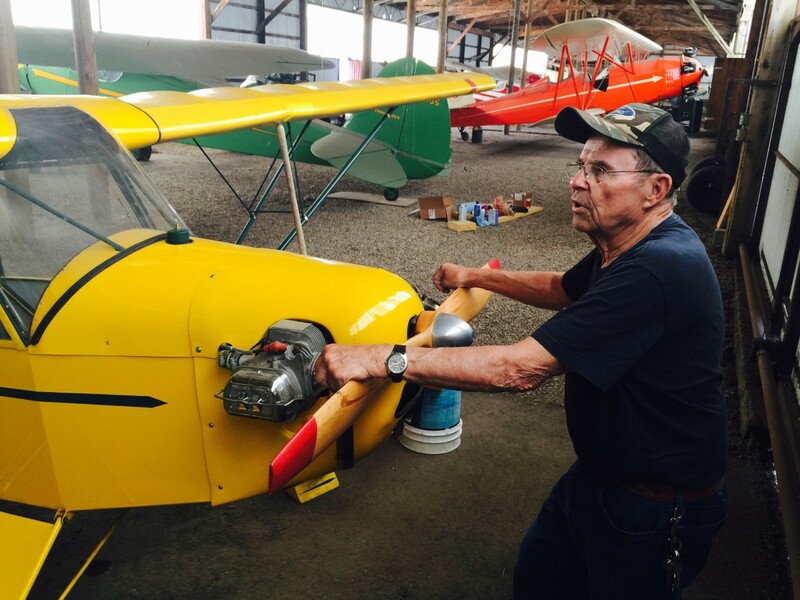 A delightful visit with Bob Miller at one of the most active hangers in North Dakota. Bob was and is instrumental in the Fargo Air Museum as many of you know. Both myself and the young fella that mowed grass at the airport scored a free lunch with Bob and his lovely wife Janice. Why is it that all us pilots marry up? After that it was back to MN for the night and a ride home on Sunday. I slowly pecked off Wahpeton, Ligerwood, Milnor and Oakes. Arnie Widmer has a nice collection of pre-WWII birds that I missed it the first go around but caught later in the summer. Another trip to Linton, again, forgot the stamp, but I did get Tater Tot Casserole! We convinced ourselves it was not Tater Tot Hotdish which is what is served to the less sophisticated. You might think the dish is named after the potato delicacy but not so. In this case it is named after the chef who whipped it up for us. Off to Wishek, Ashley, Ellendale and Lamore. I firmly placed my Lamore stamp in the (almost the same but not quite) box marked Larimore in my passport. Lamore, Larimore, what is the difference. It had me stopping back a second time to Lamore thinking I had lost my mind only to discover my mistake. A stop in Lisbon yielded a visit with John Goerger who noticed I was wearing a Lake Flyers Club t-shirt. He asked me if I knew what a Thurston Teal was? Of course I did. It is the father of the Laker Buccaneer. He was restoring one and I was invited to come back and see it. I should have asked him if he knew what a Grumman G-65 was? It was the father of the Thurston Teal that inspired this concept. And it was dubbed the “Tadpole”. How appropriate. I was getting down to my last 28 airports. It was September and I was counting on some of those perfect days we had in April. I was not disappointed. The first week in September was plated to be perfect. John couldn't go but I wasn't going to be denied. 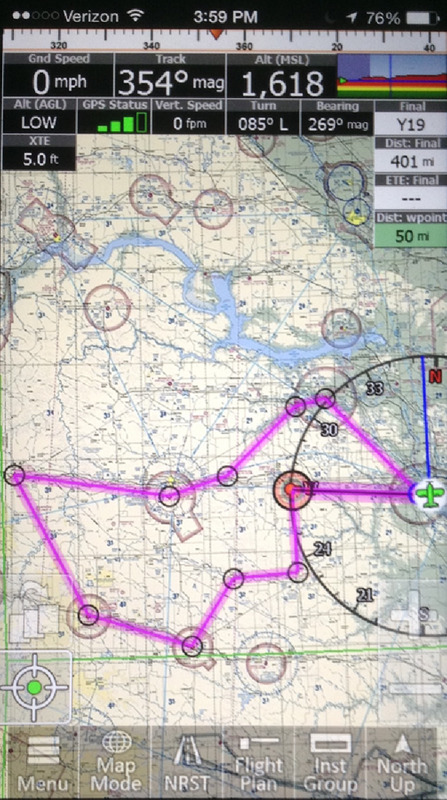 Off I went on Friday night to overnight in MN then off to a whole host of airports on Saturday and Sunday overnighting at ND99, one of the finest private strips in North Dakota with my host Howard Reeve. It was so much fun when John was available the next weekend—I did it all over again. The two of us left on Friday right after work with John who was now a full blown private pilot and in command of 171VA, the plane that started it all. We stopped in Jamestown and Valley City and overnighted in MN. In the morning we left into a day of moderate increasing westerly winds. 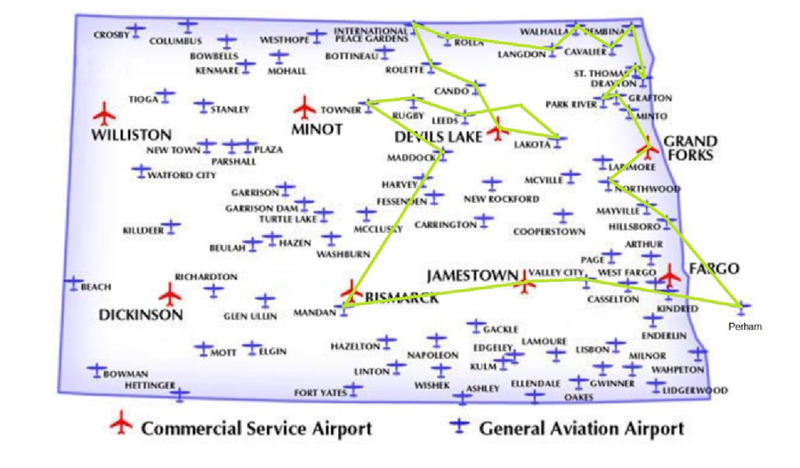 As many of the locals know the runways in the Red River Valley run north and south. We planed to be out of the valley before the wind kicked up because the surface wind forecast was not promising - westerly winds exceeding 20 knots. First stop Northwood then Grand Forks, Home of the famous University of North Dakota Aerospace Center and Cirrus Aircraft. 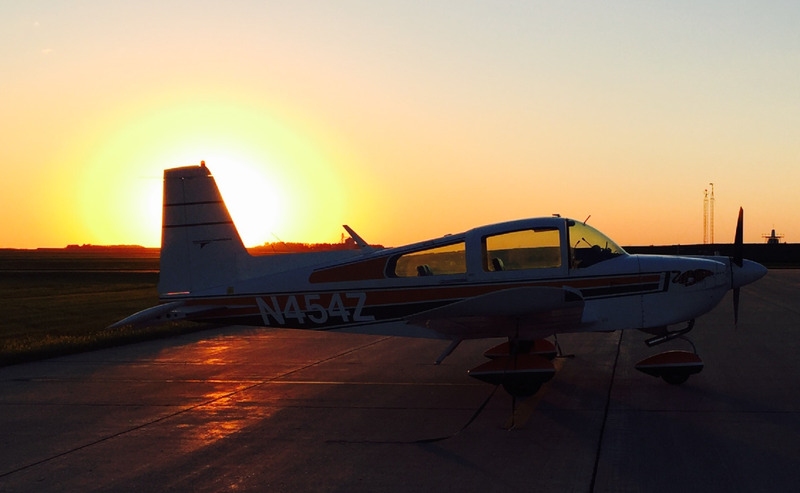 We got in line with the UND flight students at GFK and landed and rolled to the GA ramp. There was an experimental autonomous aircraft on the ramp. 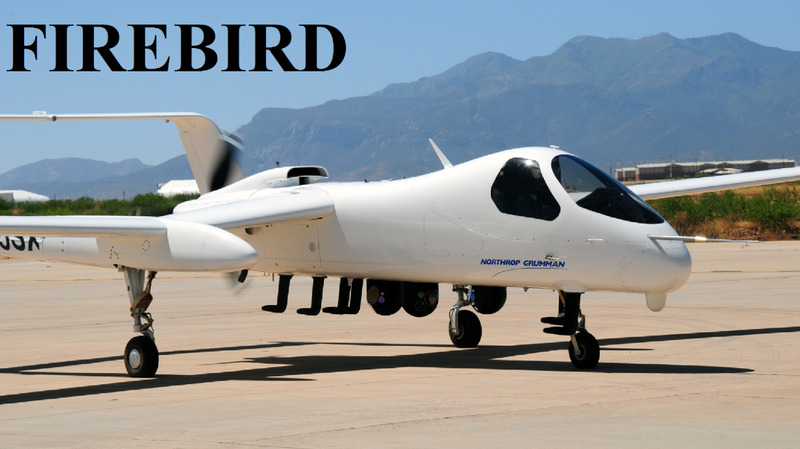 It was a Northrop Firebird, a twin boom piston pusher of Burt Rutan design. It can loiter for 40 hours. It had drooped wingtips that I speculated had some effect on wingtip vortex and in the lobby the director of the program spoke up and gave us a primer on the program. It was a vehicle that could be flown by a pilot or by a ground crew but in all instances a pilot needed to be in the cockpit to start it. Very wild indeed. We went to get the last stamp I needed to complete the Passport Program. The nice young lady behind the counter accepted her role as Master of Ceremonies and did a regal job of officiating the event. Kudos. 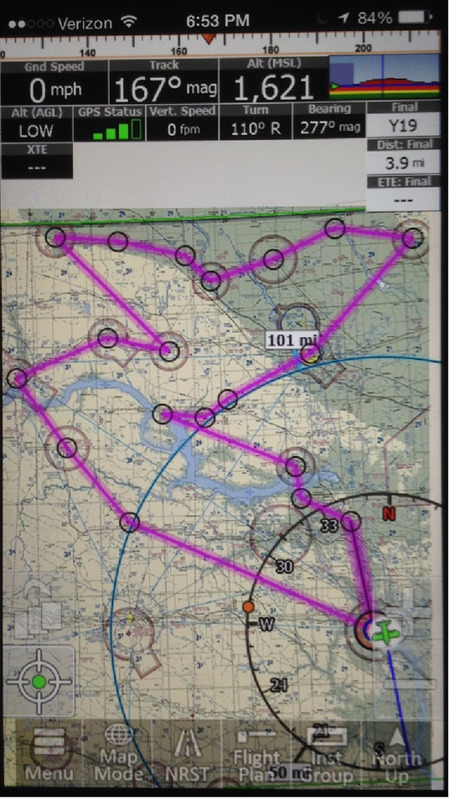 Then back in line for a departure into a 15 knot headwind on 27 with the students from UND. 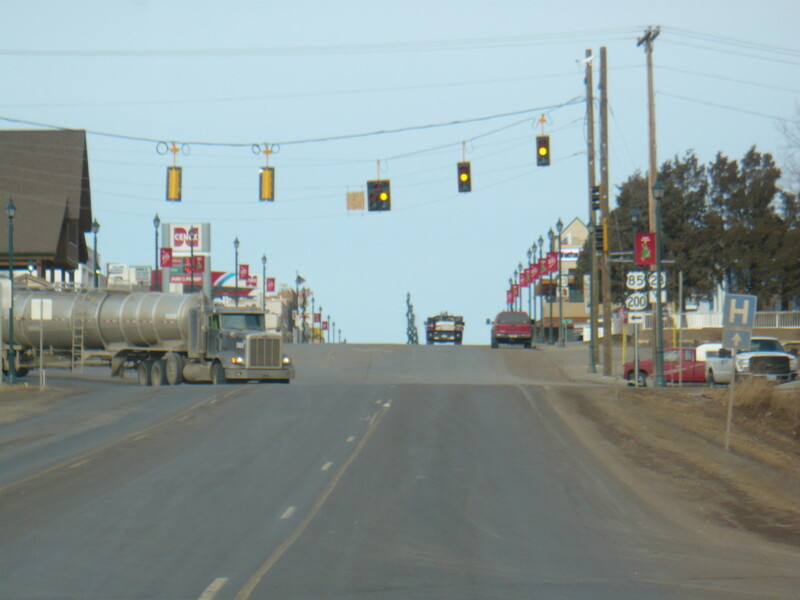 Next was the North Dakota's skinniest strip on the route, Minto. We had last years North Dakota Airport Directory which advertised it as 100ft wide but I knew better. Twenty feet was not much to work with on a 15-20 knot crosswind. John took us in for a go around then I made my first attempt. A line of trees on the north side of the strip made the approach a problem. With another go around under our belt we came around and defeated the trees for a hot landing that brought us to a stop one foot past the end of the runway. Yup our nose was in the weeds. Not bad. With a stamp in hand it was off to Grafton, Park River and St. Thomas. When we landed in St. Thomas we were hungry. We were watched by a black Suburban on the ramp so we got out to say hello. It was John Blair. John was gracious enough to haul us into town. The restaurant closed in five minutes but he thought we could take a shot at it. The doors were locked but John got the ladies to answer the door to tell us they were closed. Now it was my turn. "Are either of you girls single?" The matriarchs swung open the door and we were in. We were offered some "Hearty Soup" that I know as chili. It was just put away in the fridge. We accepted whatever they were offering and it tasted good. Next came an offer of a sandwich, then chips, then a soda and then an announcement that the Schwan's man had recently been there. "While sure I'll take some ice cream." Thanks to John we were fully fueled and off to Dayton and Pembina. Now we were in the trees and lakes. Although I knew the northeast corner of North Dakota is wooded, it makes a difference when you see it. Pembina has an old DC-3 on the ramp that was interesting but not as interesting as the package business we saw. They receive packages for Canadians who cross the border to pick them up and head back to Canada. 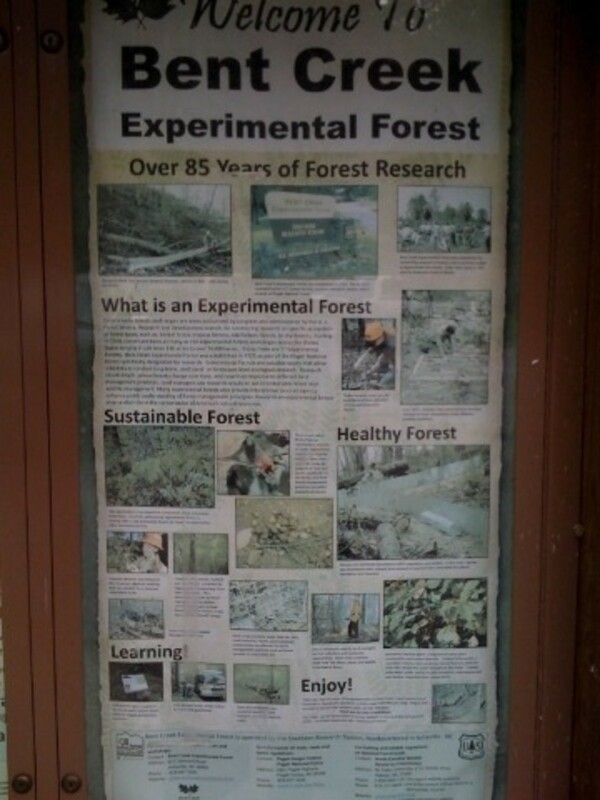 It was interesting. Next stop Cavalier and Walhalla. 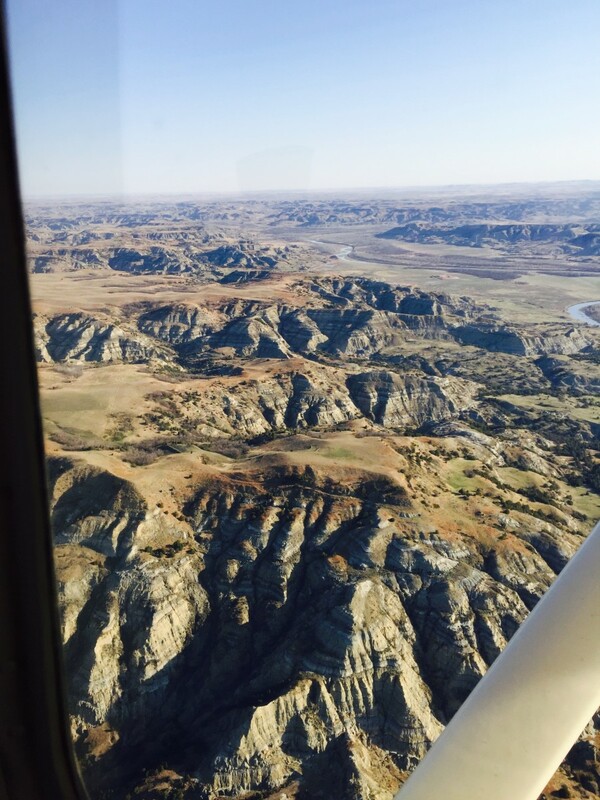 Here we flew the Pembina Gorge and it was beautiful. Now that we had the runways turned around and pointing west, the building wind was not a problem . 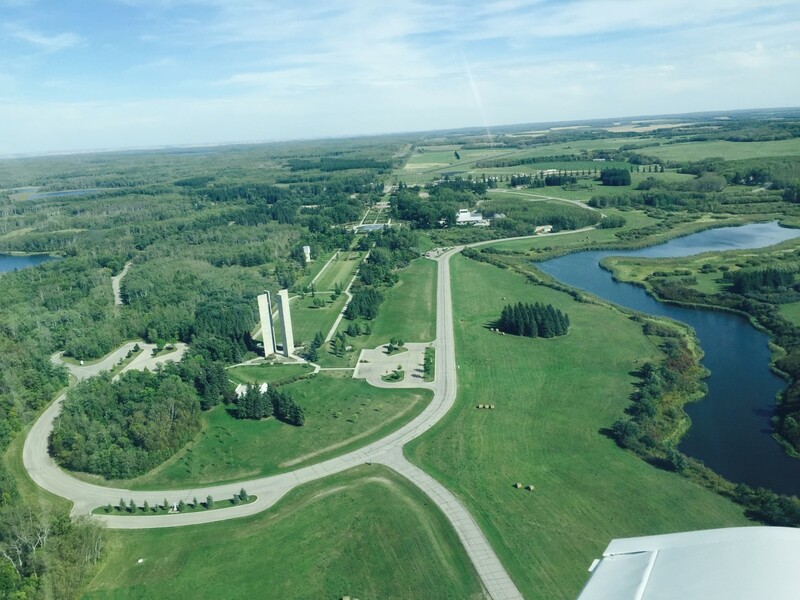 Over lake country to Langdon, Rolla and the beautiful International Peace Gardens. Next was Rollete and Cando. We ended in Devils Lake at dusk. Finally no wind for some hanger talk and the challenge of getting an airport car for the night. With the help of DL Aviation we were off to “The Ranch” Steak House for a fine meal at the end of a day in the air. In the morning we got airborne to Lakota, Leeds, Rugby and Towner. It was beautiful with no wind and the sun shining. 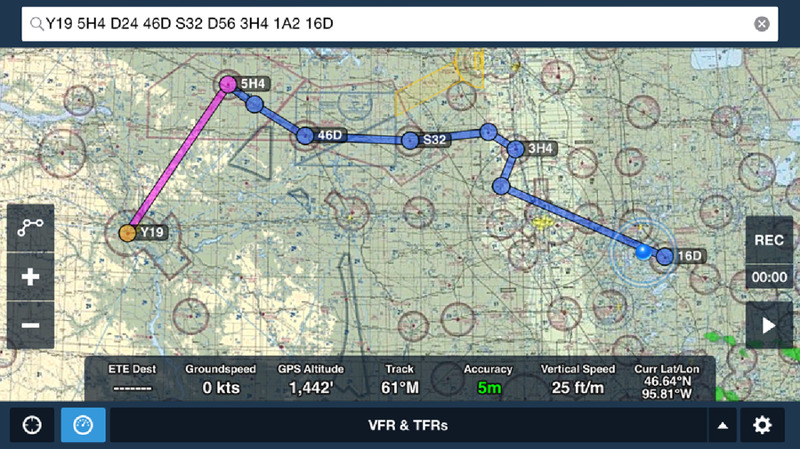 Towner has two nice prairie crosswind strips that were enjoyable. Next stop Maddock were I wrecked my prop due to a load of rocks on the taxiway. This time we simply stayed on the runway while I walked for a stamp. Then it was off to home. When I arrived at Mandan I felt a sense of accomplishment. To say the least, I think Dennis is smiling. My Passport book was full and now it seemed more valuable than my wallet. Because it was.